This industry has gone through a wild series of shocking news and scandalous turns; from an $831 billion dollar market cap to Dr. Nouriel Roubini’s Doomsday predictions. Celebrity promotion then regulatory crackdowns defined the year for some projects. Other projects had high-hopes and fell flat. Regardless of the individual twists-and-turns, ups-and-downs or horizontal charts; 2018 was a spectacular year in the blockchain sector. Tremendous development has been made and early adoption has begun… It all happened this year. In early January, Bridge Protocol came into the NEO Ecosystem with a new take on an old process. Stemming from the frustration related to KYC / AML compliance, CEO Stephen Hyduchak set on a path to bring digital identity compliance to the blockchain; ultimately benefiting both users and businesses. In March 2018, Bridge Protocol launched its first keyserver contract on the NEO Network. In the effort of supporting the increased transaction load that Bridge brought to NEO, nodes were launched in strategic locations around the world. Bridge continues to maintain these nodes for the benefit of the entire ecosystem. Following the launch, Bridge began to ramp up its research and development staff; bringing on some of the most knowledgeable and dedicated engineers, developers and systems architects in the space. As each quarter passed, Bridge managed to tailor the needs of this quickly changing sector. Projects who were stuck on a faulty vision have dropped with regularity; but Bridge continues to grow and excel past projected timelines. In November 2018, just 8 months after development started; Bridge released its first publicly accessible tool. 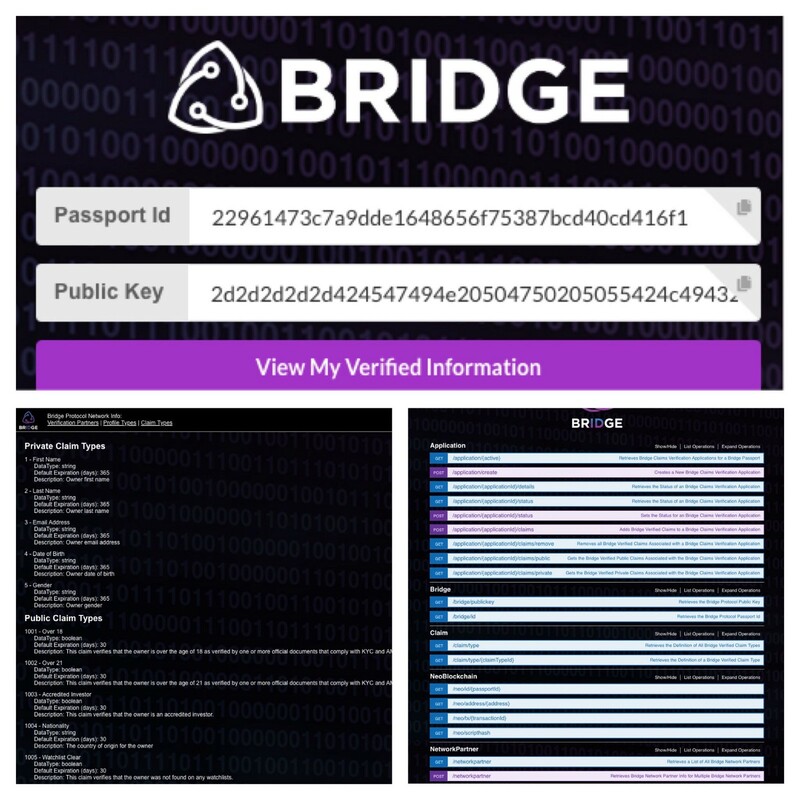 The beta release of the Bridge Passport marked the first time that a real-world identity has been digitized and packaged for multiple-uses on the blockchain. During this same public release, Bridge Protocol also opened its API and Bridge Protocol Explorer for review and development on its partners platforms. The API allows for easy integration into institutional processes and the Explorer allows for public verification of identity claims. From its earliest phases, Bridge has utilized the prior development and experience of its partnerships. To protect the initial smart contract users from the all-too-common scams; Bridge utilized Clearify to validate its wallet address. Next came the partnership with Switcheo Network for development of exchange KYC / AML compliance. Both of these partnerships remain in full swing! As development of the Identity Management Platform made progress, Onfido was selected as a KYC / AML provider, assisting Bridge with the verification of digital documents. This partnership allows Bridge Protocol to quickly offer a reliable and stable verification partner to its users. As progress is made, the give and take characteristic of partnerships becomes more apparent as opposed to theoretical partnerships and mutually shared graphics. Throughout the year, only one thing has remained the same in the blockchain space… community participation and development. To give back to our community and create excitement, Bridge Protocol held numerous community contests! These contests included infographic design, t-shirt designs and even swag giveaway contests! Spurred by a simple community-based competition, we were met with some serious talent. The results were astonishing. The creativity was inspiring. The team continues to knock out its roadmap goals quickly! As its founding direction, Bridge utilized its roadmap to quickly and effectively execute the necessary steps in establishing the Bridge Identity Management System. The launching of infrastructure and integration of services all relied on each others timely execution. Although some goals were completed ahead of schedule, it was no easy task to make that happen. Many coffee beans were destroyed in the creation of Bridge. As our platform evolves, so do our roadmap goals. We are excited to quickly bring advances to our blockchain infrastructure; from making payment of tokens across chains easier and more accessible to reducing the cost of Know-Your-Customer (KYC) and Anti-Money-Laundering (AML) compliance checks. 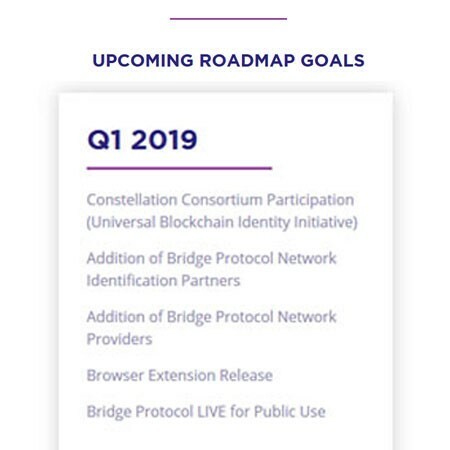 Recently added to the roadmap, Bridge has agreed to participate in the Constellation Consortium — with community projects working together to develop NeoID and create a universal blockchain identity. We are dedicated to growing the business in a responsible and community driven way. With the teams mutual goal to create a superior product; everyone has found the best way to utilize themselves and others. Throughout the year, a number of changes were made in the team to best execute our goals. Alex Guba, hired initially as Chief Systems Architect quickly found his place as Chief Technology Officer (CTO); allowing Andrew Hyduchak to best utilize his time as Chief Information Officer (CIO). These changes led to infrastructure breakthroughs from our Chief Information Officer (CIO), Andrew Hyduchak. For example, construction of unique containerization schemes for our software through Kubernetes. This gives Bridge an edge on legacy businesses that need years to adopt to this form of storage. With the pieces in place Bridge brought some additional brainpower to the process; bringing on two new developers; Joseph Staff and Matthew Bromley. As the team continues to grow, each and every member builds off the strengths of the entire team. One thing is for sure: 2019 will be the year Bridge shakes up an industry ripe for cost reduction and automation. We have active communities on Telegram, Reddit and Twitter; watch these social media channels for the newest from our team! Thanks to Jesse Lama and Stephen Hyduchak.